Below is Dean Jim Goldgeier’s message to the SIS community following President Obama’s appearance at SIS on August 5, 2015. We were deeply honored to host President Barack Obama on Wednesday, August 5, at American University's School of International Service (SIS) for an historic address on the Iran nuclear agreement. During his remarks, the president echoed John F. Kennedy's famous "Strategy of Peace" commencement speech at American University in 1963, stating that "it is surely the pursuit of peace that is most needed in this world so full of strife." Wednesday marked President Obama's second visit to SIS. 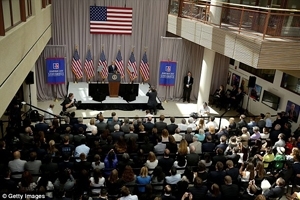 In July 2010 he delivered a major immigration speech in the newly opened SIS building, calling for a system that "reflects our values as a nation of laws and a nation of immigrants." American University has a long tradition of presidential visits extending back to the university's founding, and President Dwight Eisenhower broke ground at the establishment of SIS in 1957. It has been tremendously heartwarming to hear from our alumni, current and incoming students, and other members of the SIS community who have reached out over the past few days to convey their pride in SIS for hosting President Obama on such a momentous occasion. Please join us on Facebook and Twitter @AU_SIS to continue these conversations.